By the conclusion of the Mexican-American War, in 1848, military conquest had added 1.2 million square miles of new territory to the United States, and the discovery of gold in California that same year further whetted American enthusiasm for westward migration. Yet the seemingly limitless promise of expansion bore the heavy cost of a long-postponed reckoning with the question of slavery. Southern slaveholders envisioned the region as the salvation of plantation agriculture, by which overworked areas of the Southeast could be abandoned for fresh lands to the West. For Northerners, the West offered a different kind of safety valve, one that would alleviate economic pressures caused by severe economic shifts, heightened class divisions, and massive immigration from northern and western Europe. The contest over free or slave labor in the West was in fact a contest over the future of the nation. In 1857, the Supreme Court declared in Dred Scott v. Sanford that it was unconstitutional for Congress to legislate on the future of slavery in the territories, implicitly allowing the spread of slavery throughout the union. The decision signaled an abrupt end to decades of Congressional attempts at compromise, including the Missouri Compromise, the Compromise of 1850, and the Kansas-Nebraska Act. Whereas northern Republican opinion tended to focus on the bias of the predominantly southern court, this editorial, from a Democratic newspaper in Cincinnati, instead lauds the judges for their patience, thoroughness, and wisdom. While Cincinnati was part of Ohio, later part of the Union, its location directly across the river from Kentucky (later a Confederate state) likely added an element of pro-southern feeling to the city, and to this editorial. It provides an interesting example of the manner in which party and sectional feelings sometimes worked at cross-purposes during the 1850s. During the 1850s, the question of whether and how the slave system would expand into new territories and states became increasingly contentious and even violent. After Congress decreed in 1854 that the question would be decided in the Kansas Territory by “popular sovreignty,” in the form of a referendum by registered voters, struggles there between pro-slavery forces (known as “ruffians”) and abolitionists (known as “free soilers”) escalated. In late May,1856, pro-slavery forces attacked and destroyed Lawrence, Kansas’s largest town. A day later, responding to an abolitionist speech by Senator Charles Sumner of Massachusetts, Representative Preston Brooks of South Carolina beat Sumner thirty blows with a cane on the Senate floor. On the whole, northerners reacted to the caning of Sumner with outrage and southerners with defiant glee. This brief editorial by a Republican-affiliated newspaper links the Kansas and Sumner incidents and urges “people of the Free States” to submit no longer to slaveholder attacks. When Representative Preston Brooks of South Carolina beat Senator Charles Sumner of Massachusetts on the floor of the U.S. Senate in May, 1856, the division between supporters and opponents of slavery became ever more apparent. This South Carolina editorial lauding Brooks’ attack typified southern reaction to the incident. Delighted at the public spectacle of a northern abolitionist being beaten like a “scamp” (and also, in an unspoken analogy, like a slave), the editorial concludes by expressing the inevitability of violent conflict over the slavery question. The editorial’s epigraph, “Hit him again,” probably refers to the inscription on the new cane that merchants in Charleston, South Carolina, purchased for Brooks. During the1850s, the tenuous American political consensus over slavery began to unravel, and by 1856 the country was bitterly—and sometimes violently—divided. In May, 1856, Representative Preston Brooks of South Carolina responded to a perceived insult in an abolitionist speech by Senator Charles Sumner by beating Sumner nearly to death with a cane on the Senate floor. This newspaper editorial lists the many groups of South Carolina citizens praising Brooks with speeches, gifts, and congratulatory messages. These allegedly included a group of slaves who had collected money for a “token of their regard” for Brooks. The editorial concludes by insisting that Brooks’ violent deed will be praised “from Washington to the Rio Grande,” invoking the nation’s large pro-slavery region. In 1857, the Supreme Court ruled in Dred Scott v. Sanford that the enslaved Scott's four year residence in the free North was not sufficient to make him a free man. In his majority opinion, Chief Justice Roger B. Taney cited two main rationales for ruling against Scott; first, as an African American, Scott "had no rights which the white man was bound to respect," and was therefore not eligible bring a suit to court. Second, slaves were property, the same as any other, so by prohibiting slavery north of the 36'30? line, the Missouri Compromise of 1820 violated citizens' constitutional rights against unwarranted seizure of property. Taney's decision effectively made it impossible to prevent the spread of slavery, even in states that had outlawed it decades earlier. To this day, many legal historians consider the Dred Scott ruling the worst decision ever made by the Supreme Court; it was overturned by the passage of the 13th and 14th amendments to the Constitution in 1865 and 1868, respectively. "Vote for Fremont and Freedom"
Northern politicians depicted the May 1856 beating of Massachusetts Senator Charles Sumner by South Carolina Representative Preston Brooks as an example of the South's brazen disrespect for the welfare of the nation and the interests of its northern brethren. This campaign pamphlet for the 1856 presidential election uses the beating as a springboard from which to appeal to northerners to support John Fremont, the Republican candidate, against Democrat James Buchanan, the eventual victor, who is vilified here for his support of Brooks. If elected, Fremont's vision of a "Free Soil" Kansas would have been thoroughly detrimental to slaveholder interests. The pamphlet invokes the wisdom of the aged Massachusetts politician Josiah Quincy, who argued that the North must finally stand up to southern insolence, lest it find itself every bit as subordinate to the southern slaveocracy as were the slaves whom Sumner was fighting so hard to emancipate. On May 19 and 20, 1856, Republican Senator Charles Sumner of Massachusetts delivered a speech on the Senate floor denouncing Democratic efforts to force slavery onto the Kansas Territory. In the course of the speech, Sumner denounced his fellow Senator Andrew P. Butler of South Carolina for having taken “the harlot slavery” as his mistress. On May 22, Butler’s distant cousin, Representative Preston Brooks, retaliated for the insult by beating Sumner on the nearly deserted floor of the Senate, landing as many as thirty blows with his walking stick. It took Sumner, who became an anti-slavery martyr, three years to recover from his injuries and return to the Senate; Brooks became a hero to slaveholders. The sacking of Lawrence, Kansas, by hundreds of slavery supporters took place the day before Brooks’ attack on Sumner, and the shocking extension of violence from the western territories into the halls of Congress widened the national political divide over slavery. This image is attributed to artist Winslow Homer. In 1854 the U.S. Senate passed, and Democratic President Franklin Pierce signed into law, the Kansas-Nebraska Act. This Act split the Kansas territories into two states, Kansas and Nebraska, and decreed that “popular sovereignty,” in the form of a referendum by registered voters in the state, would determine whether all future states admitted to the union would allow slavery or not. Pro-slavery Missourians (known as “border ruffians”) poured across the border, hoping to claim the Kansas Territory for themselves. But even more settlers arrived from the free states, thousands of whom were aided by abolitionists back East who formed the Kansas Emigrant Aid Society to assure that the territory would remain free of slavery. Confronted by a free-soil majority, the pro-slavery forces quickly resorted to voting fraud, armed intimidation, and violence. When antislavery forces responded, undeclared guerrilla war followed. This 1856 political cartoon linked the Democratic Party’s presidential campaign platform with the increasingly violent struggle over slavery in Kansas. The frequently violent struggle over slavery in the Kansas territories in the 1850s was carried out by emigrants who settled there expressly to advance their political views about slavery. Northern abolitionists formed the Kansas Emigrant Aid Society to recruit and support anti-slavery settlers to the territories. Pro-slavery Missourians, known as “border ruffians,” responded by moving north into the Kansas territory with their slaves. Concluding that Missouri “has done her duty,” this “appeal” appeared in DeBow’s Review, a journal on agricultural and political subjects for southern plantation owners. It calls on other supporters of slavery from throughout the South to do the same by contributing their bodies and their funds to support the struggle over the future of slavery, indeed over the future of the union itself. This campaign song for Republican candidate for President Abraham Lincoln and his running mate, Hannibal Hamlin, draws on the popular notion of Lincoln as a down-to-earth “rail splitter.” The “rail splitter” image associated Lincoln, a shrewd and articulate lawyer, with his frontier origins and a homespun image of American self-reliance. The song works several people and issues from the pivotal 1860 campaign into the “rail splitter” theme, including incumbent Democratic President James Buchanan; the Homestead Act and Republicans’ support of free labor rather than slavery in the West; Republican support for higher taxes on imported goods, known as “protective tariffs;” and the pro-slavery “Border Ruffians” who contributed to violence in the Kansas territory during the 1850s. The song also refers to the “loco focos,” a Democratic party faction from the 1830s and to Pennsylvania gubernatorial candidates, Democrat Henry Foster and Republican Andrew Curtin (a staunch Lincoln supporter). The election of Abraham Lincoln as President in 1860 capped a decade of escalating political conflict over whether to allow slavery in the newly forming western territories and states. Many southerners believed that Lincoln’s election signaled the end of states’ rights and the imminent end of the slave system that structured the southern economy and society. While some pro-slavery southerners favored immediate secession, others initially sought to wait until the policies of the new administration toward slavery became clear. In February 1861, representatives of the first seven states to secede (South Carolina, Mississippi, Florida, Alabama, Georgia, Louisiana, and Texas) met to establish a new government, known as the Confederate States of America, and elected Mississippi slaveholder Jefferson Davis as President. This Mississippi declaration of secession includes the major southern arguments for secession, defends slavery, and enumerates grievances against the federal government that dated back to the Constitution.The election of Abraham Lincoln as President in 1860 capped a decade of escalating political conflict over whether to allow slavery in the newly forming western territories and states. Many southerners believed that Lincoln’s election signaled the end of states’ rights and the imminent end of the slave system that structured the southern economy and society. While some pro-slavery southerners favored immediate secession, others initially sought to wait until the policies of the new administration toward slavery became clear. In February 1861, representatives of the first seven states to secede (South Carolina, Mississippi, Florida, Alabama, Georgia, Louisiana, and Texas) met to establish a new government, known as the Confederate States of America, and elected Mississippi slaveholder Jefferson Davis as President. This Mississippi declaration of secession includes the major southern arguments for secession, defends slavery, and enumerates grievances against the federal government that dated back to the Constitution. 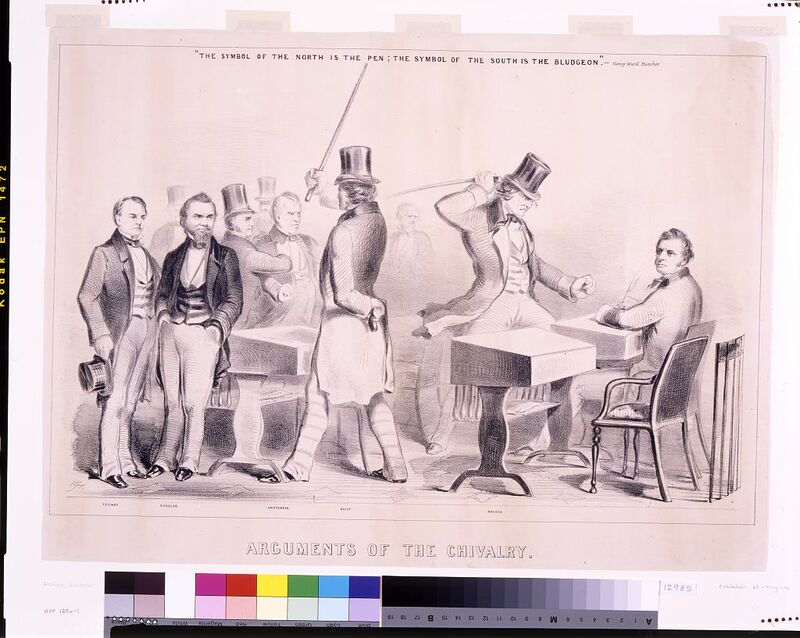 The presidential election of 1860 pitted four candidates against each other. The Democratic Party broke apart over the issue of the expansion of slavery: northern Democrats, who were opposed to slavery, nominated Stephen Douglas while pro-slavery southern Democrats nominated John C. Breckenridge. The Constitutional Union Party, which sought to delay action on the slavery issue and was made up of a combination of members of the earlier Whig and Know-Nothing parties, nominated John Bell. The newly formed Republican party, which opposed slavery, nominated Abraham Lincoln. As this map demonstrates, the nation’s voters split almost exactly along regional lines, with most southern states supporting pro-slavery candidates and most northern states supporting anti-slavery candidates. With the election of Abraham Lincoln as President in 1860, many southern slave owners became convinced that the only way to protect their right to own slaves was to secede from the U.S. and establish their own pro-slavery country. By February, 1861, the lower South states most dependent on slave labor (South Carolina, Mississippi, Florida, Alabama, Georgia, Texas, and Louisiana) seceded and formed the Confederate States of America, also known as the Confederacy. Four months later, Virginia, Tennessee, North Carolina, and Arkansas had also joined the Confederacy. This special newspaper broadside printed on December 20, 1860, informed the citizens of Charleston that South Carolina had voted to secede from the United States. In the presidential election of 1860, Republican candidate Abraham Lincoln, a lawyer and former one-term Congressman from Illinois, defeated candidates from a fractured Democratic party (Stephen Douglas and John C. Breckenridge) and the Constitutional Unionist Party (John Bell). Lincoln took the then-moderate position that the federal government would not interfere with slavery where it already existed but would oppose its further expansion. Even that was too much for southern supporters of slavery, who deeply distrusted the Republicans and believed that the expansion of slavery was necessary for the South’s survival. Before Lincoln could even take the oath of office in March, 1861, seven southern states seceded from the union and formed the Confederate States of America. The passage and enforcement of the 1850 Fugitive Slave Law meant that no escaped slave was safe, since even those living in the free North could be arrested and re-enslaved. After passage of the Law, escaped slave women living in the North sometimes wore veils when they appeared in public to avoid identification by slave-catchers. The Fugitive Slave Law of 1850 placed the full weight of the federal government behind the apprehension of runaway slaves. This fact was best illustrated by the arrest of Thomas Sims, who escaped slavery in Georgia. Sims was arrested in Boston in April, 1851, and, under the Fugitive Slave Law, returned to his owner. The city’s abolitionist movement agitated for his release and large crowds surrounded the courthouse in which Sims was incarcerated. But these efforts, which included plans to forcibly free the prisoner, did not succeed. This picture from a Boston illustrated weekly shows how Sims was conducted by three hundred armed police and marshals to a navy ship that carried him back to slavery. Upon his return to the South, Sims was sold to a new master in Mississippi. He escaped in 1863. Born in 1795, Dred Scott was a slave who sought his freedom by bringing a landmark case before the U.S. Supreme Court. Scott argued that he had become free when his master took him into a free state (Illinois) and a free territory (Wisconsin). The Court’s 1857 decision in Dred Scott v. Sandford nullified previous political compromises over the expansion of slavery by declaring that because slaves were property, any law excluding slaves from the territories was unconstitutional. Dominated by southerners and their sympathizers, the Court also reasoned that neither Scott nor any African American had the right to bring suit, because when the Constitution was ratified they were considered inferior beings and thus they did not enjoy “any rights which the white man was bound to respect.” Southern slave owners used the ruling to argue that the federal government could pass no legislation interfering with “Southern interests.” Horrified northerners protested that, if followed to its logical conclusion, the Dred Scott ruling could lead to legalizing slave ownership not only in the territories but in the free states as well. With the Compromise of 1850, Congress agreed to admit California to the U.S. as a free state; to allow slavery in the new territories of New Mexico and Utah; to prohibit the slave trade in Washington, D.C.; and to pass the Fugitive Slave Law. The Fugitive Slave Law denied a jury trial to anyone accused of escaping from slavery; gave marshals tremendous leeway to pursue slaves into free states; and empowered the federal government to prosecute northerners who shielded runaways. This law shocked northerners and drew them into the conflict over slavery in an unprecedented way. Violent and sometimes lethal encounters pitted fugitive slaves (and sometimes free African Americans who were seized as if they were escaped slaves) and their white allies against southern pursuers. This notice, posted in Boston by abolitionist Theodore Parker in 1851, reflects the new atmosphere in the North for African Americans, one marked by an ever-present fear of kidnapping and conflict. In the mid-nineteenth century, many Americans were eager to acquire additional territory from Mexico, and U.S. President James K. Polk was prepared to provoke a war to get it. In 1845, following the Congress’s annexation of Texas as a new state, Polk stationed General Zachary Taylor and his forces along the Rio Grande River. The Mexican government, pledging to restore Texas to Mexico, soon attacked. The U.S. Congress declared war on Mexico in May, 1846 and authorized the enlistment of 50,000 volunteers. The war ended in early 1848, when the U.S. annexed half of Mexico, 1.2 million square miles of land. This political cartoon features a beardless Uncle Sam, his legs symbolizing the southern and western states (with Texas on his boot) that drove the quest for new territory. Cutting the already diminutive figure of Mexico in half, the scissors invoke the military campaign of General Zachary Taylor and his volunteer army. In 1854 the Kansas-Nebraska Act split the Kansas territories into two states, Kansas and Nebraska, and decreed that “popular sovereignty,” in the form of a referendum by registered voters in the state, would determine whether any future states admitted to the union would allow slavery or not. Pro-slavery Missourians (known as “border ruffians”) poured into the territories, as did abolitionist supporters determined to prevent the spread of slavery. In the summer of 1856, proslavery forces attacked Lawrence, burning buildings, looting stores, destroying two newspaper offices, and beating residents. Hearing the news, John Brown and some supporters sought revenge by replicating the damage imposed on Lawrence in a small settlement of proslavery families along Pottawatomie Creek. The sacking of Lawrence and the murder and mutilation of five men at Pottawatomie Creek sparked a guerrilla war in Kansas that raged for months and cost some two hundred lives.